Discuss with your partner how Lin’s method is similar to and different from drawing base-ten diagrams or using the partial quotients method. Lin subtracted $ 3 \boldcdot 2,$ then $3 \boldcdot 1$, and lastly $3 \boldcdot 9$. Earlier, Andre subtracted $3 \boldcdot 200,$ then $3 \boldcdot 10$, and lastly $3 \boldcdot 9$. Why did they have the same quotient? In the third step, why do you think Lin wrote the 7 next to the remainder of 2 rather than adding 7 and 2 to get 9? Lin’s method is called long division. Use this method to find the following quotients. Check your answer by multiplying it by the divisor. Here is Priya’s calculation of $906 \div 3$. Priya wrote 320 for the value of $906 \div 3$. Check her answer by multiplying it by 3. What product do you get and what does it tell you about Priya’s answer? Describe Priya’s mistake, then show the correct calculation and answer. Long division is another method for calculating quotients. It relies on place value to perform and record the division. When we use long division, we work from left to right and with one digit at a time, starting with the leftmost digit of the dividend. 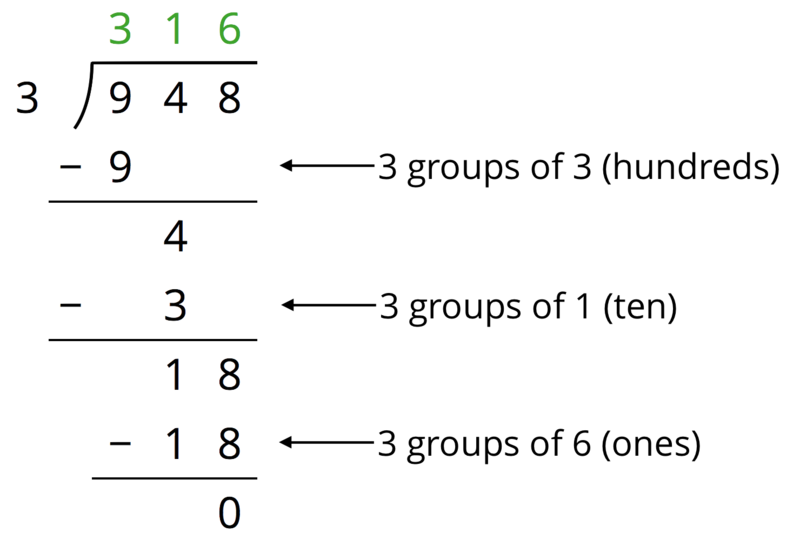 We remove the largest group possible each time, using the placement of the digit to indicate the size of each group. Here is an example of how to find $948 \div 3$ using long division. We start by dividing 9 hundreds into 3 groups, which means 3 hundreds in each group. Instead of writing 300, we simply write 3 in the hundreds place, knowing that it means 3 hundreds. There are no remaining hundreds, so we work with the tens. We can make 3 groups of 1 ten in 4 tens, so we write 1 in the tens place above the 4 of 948. Subtracting 3 tens from 4 tens, we have a remainder of 1 ten. We know that 1 ten is 10 ones. Combining these with the 8 ones from 948, we have 18 ones. We can make 3 groups of 6, so we write 6 in the ones place. In total, there are 3 groups of 3 hundreds, 1 ten, and 6 ones in 948, so $948 \div 3 = 316$. Long division is an algorithm for finding the quotient of two numbers expressed in decimal form. 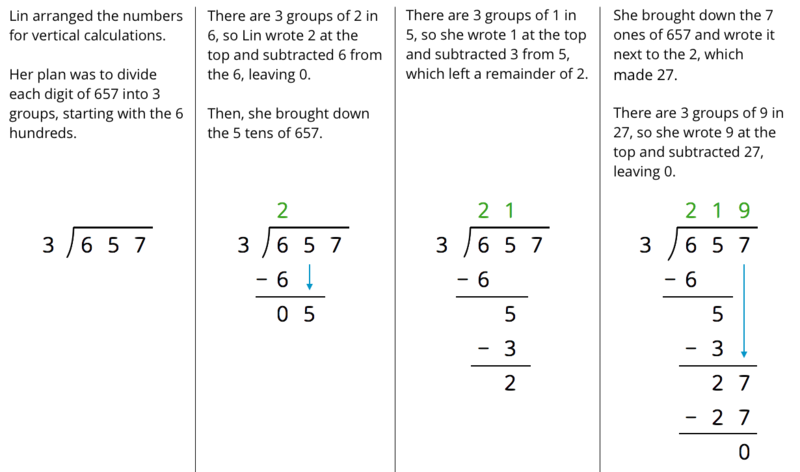 It works by building up the quotient one digit at a time, from left to right. 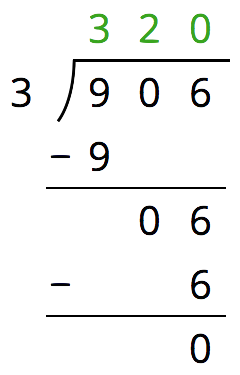 Each time you get a new digit, you multiply the divisor by the corresponding base ten value and subtract that from the dividend. Using long division we see that $513 \div 4 = 128 \frac14$. We can also write this as $513 = 128 \times 4 + 1$.